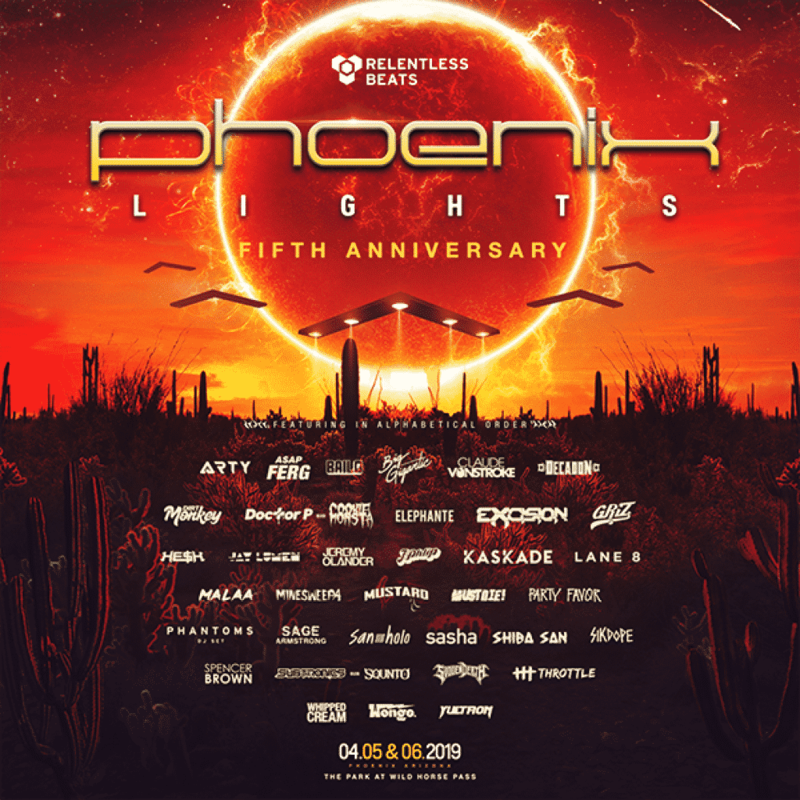 Phoenix, Arizona (March 18, 2019) – With less than a month to go before some of the universe’s best artists invade The Park at Wild Horse Pass, Phoenix Lights has added four new artists to the lineup. Self-described as ‘where luxury and irony intersect’- Black Caviar; the out of the box sound architect, Devault; Warehouse Bass impresario, Dillon Nathaniel, and breakout electronic artist, Vanic will join an already massive assault of sight and sound. Coming with this announcement is the breakdown of artists-by-stage, which includes: the Mothership, the Invasion Stage, RBDeep’s Colony Stage, and Fallout, introducing the local lineup for the first time. Stages listed below in alphabetical order. General Admission weekend passes for Phoenix Lights Festival are on sale now for $169, before fees. Also, two general admission 2-Day passes are available for $320, through Sunday March 17th.VIP weekend passes will be available at two levels: Standard VIP, including everything that a GA ticketsprovides, plus express VIP entrance, a commemorative lanyard, access to VIP lounge, access to VIP viewing deck, premium restrooms and passed desserts in the VIP areas. Platinum VIP includes everything that the Standard VIP pass includes, plus: complimentary drinks, side stage viewing at the main stage, access to artist hospitality lounge, steakhouse quality dinner, exclusive festival gift bag and festival concierge. You must be 21+ to purchase Platinum VIP passes. All details and ticket types are available online at www.phoenixlightsfest.com and www.relentlessbeats.com. Phoenix Lights is an 18+ event.